I lost power at my house last night, due to Hurricane Irma. Thankfully there wasn’t any serious damage at my house, only minor flooding and some branches down. I had some family evacuate from their homes to stay with me, and I have just gotten a new puppy and I was taking care of him. I have a fair amount of NetGalley books that I have to read. I was avoiding them because the amount of NetGalleys I had to read was stressing me out, and the longer that I avoided them the more stressed out I got. But because the power got knocked out, I used my fully charged Kindle to read; I figured it was the perfect time to work on my NetGalleys. I only had a few downloaded, for some unknown, unfortunate reason. I’m going to have to download the rest. I was pleasantly surprised by the book that I read; my most recent NetGalley reads had been less than thrilling. I really did love this book. I was fond of the main character. Aventurine was honestly pretty reckless, and she frequently wanted to pick fights. I loved it. She didn’t come across as typical; I feel like it can be difficult to make female characters who are different from other female characters, but this author succeeded in making a unique protagonist in Aventurine. She was a dragon, even when she was human. She still had her dragon values and nature, and she made sure that she didn’t lose her inner dragon, even when she wasn’t physically a dragon any longer. I would give this book an A+ for the protagonist development; it’s not too common that I truly like the main character. I really did love Aventurine, how she manages to brashly talk her way into an apprenticeship, and I really love her relationship with Marina. They amused me. Two very bold, frank, workaholics in one kitchen? It was hilarious. They were so similar and the way that they teamed up made me laugh. Honestly, I didn’t even find myself trying to predict the ending. I was just enjoying the process of reading, and seeing the events unfold. That being said, there was a bit of an unexpected reveal at the end. I would certainly recommend this book. It is definitely good for adults who enjoy a well-written middle grade novel now and then, and I HIGHLY recommend this for the intended age range. I would definitely buy this book as a gift. That’s another thing. There wasn’t any romance in this novel. 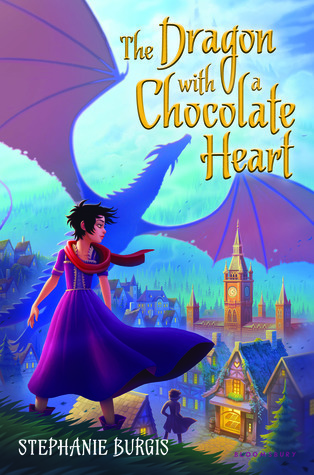 A cute romance in a MG book is great now and then, but it’s certainly refreshing when one isn’t needed as a subplot. Aventurine can carry this novel all on her own. This was such a good cute read! I loved it!